Nepal's first and most famous national park is situated in the lowlands of inner Terai. Covering an area of 932 sq. km the park includes hilly areas covered by deciduous forest. This ecologically diverse area is the last remaining home in Nepal for more than 300 of the endangered Asian one-horned rhinoceros and harbors one of the largest population of the elusive and rare Royal Bengal Tiger. 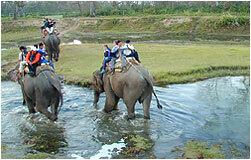 Beside the Rhino and Tiger, Chitwan also supports a great variety of flora and fauna. There are four species of deer, including the spotted Chital, Leopard, Sloth bear, Wild boar, rhesus monkey, Grey Langur monkey, wild dog, small wild cats, the white gaur (the world's largest wild cattle) and many other smaller animals. In a stretch of the Narayani River is found one of the few remaining of populations of the rare and endangered fish-only eating Gharial or Gangetic crocodile. For the ornithologist and the amateur bird watcher the park offers excellent possibilities with more than 450 species. Suggested Itinerary. Please note this itinerary can be customized according to your requirements. Day 01 : Arrival KATHMANDU International Airport, welcome transfer to hotel and rest of the day free for leisure. Overnight at hotel. Q/N. Day 02 : After breakfast, half day sightseeing or Pashupatinath temple, Bouddhanath Stupa. Enjoy a traditional Nepalese dance program in the evening. Day 03 : After breakfast, transfer to Chitwan by road. Check into lodge/resort/Camp. Jungle activities after lunch. Day 04 : Full day Jungle activities. Day 05 : After breakfast, either departure transfers to Bharatpur airport for flight to Kathmandu or overland transportation to Kathmandu. What to bring :-To help you obtain the most from your visit we suggest you bring: - Walking shoes, rubber sandals, modest swim wear, sun hat, sun lotion, insect repellent, personal medicines, torch, binoculars, extra video batteries and camera films.